tiiildd...[CR] Transmit a standard (11bit) CAN frame. dd the data byte values in hex (00-FF). 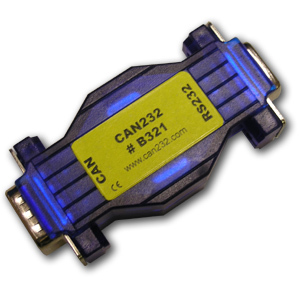 The CAN232 and CANUSB are almost completely program compatible. The Lawicel CANUSB interface looks to the PC like a serial device and is easily programmed by sending the requires string of characters to the USB's simulated COM: port. CANUSB is a very small dongle that plugs into any PC USB Port and gives an instant CAN connectivity. It is treated by software as a standard COM: Port (serial RS232 port) which eliminates the need for any extra drivers and makes programming of simple CAN sequences very easy for the novice VB or C programmer. transmitting and receiving being done in standard ASCII format. Installing a direct driver DLL allows faster communications and higher CAN bus loads. Low level Ascii Commands via USB COM: class driver, DLL or ActiveX interfaces. The cable length may be selected to suit customer demands, however for distances over 5M or in harsh industrial environments customers are working outside the USB standard and will need to investigate/test the units performance possibly using active cables. Note that the CANUSB and CAN232 are supplied with a simple bus monitor and example programs - they are not supported by the advanced data logging PCAN Explorer application. The Lawicel CAN232 interface provide a simple and lowest cost connection between micro-controllers, PCs and other intelligent hosts and a CAN-network. CAN232 supports both 11 bit ID and 29 bit ID CAN specifications with a maximum throughput of 1000 short messages/sec at 115,200 baud. The RS232 interface standard is ideal for use with PCs where it can be connected to a standard COM port with no system software as well as allowing legacy equipment to easily interface to CAN. CAN232 includes a 32 message receive buffer, a millisecond time stamp on messages if required and an Auto Poll mode in which all CAN messages are passed directly to the RS232 port without having to be requested individually. Firmware can be uploaded to incorporate new features as they are released. Simple monitor and transmit applications are available that are written in Delphi and VB6. Source is supplied so they act both as test/setup tools and as sample code to get you going. C++ and Linux code is also available. We can also supply this product as a DIP28 package for you to integrate into your application ( with or without RS232 Level transceiver ). Prices for one off are on the web shop call us for volume pricing. PCAN Modules CAN modules with configurable digital and analogue I/O.